Why not sell both covered calls and cash-secured puts on the same stock? I’ve been asked this question numerous times. There is actually a strategy that incorporates both BCI go-to strategies into one overall game plan. It is known as the covered strangle. The top two components represent the covered call aspect and the last is where we sell the cash-secured put. We are looking to generate monthly cash flow while at the same time positioning ourselves to buy a stock at a “discount” should the share price expire below the put strike. Inherent in this plan is that we are willing to own twice as many shares as we currently own even if share price moves below the put strike. The risk is to the downside only. If there is price decline below the put strike, we double our position with half purchased initially and the other half at the put strike. Share price can move to zero. Of course, we always have our exit strategy arsenal to mitigate losing positions. All strikes must offer our initial time value return goals. 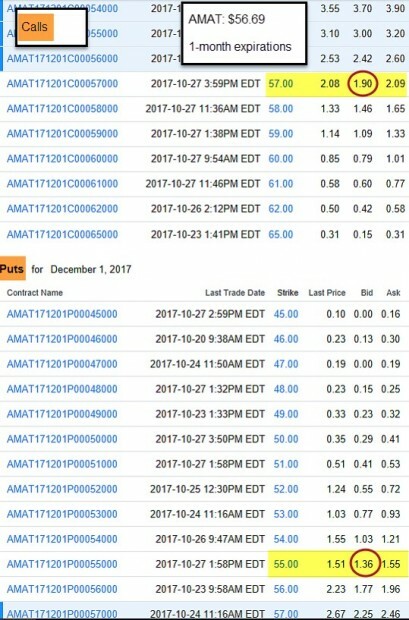 The yellow fields in this option chain highlight the out-of-the-money $57.00 call (with AMAT trading at $56.69) and the out-of-the-money $55.00 put. The bid prices (circled in red) are $1.90 and $1.36 respectively. The cost basis is the mid-point between the cost of shares initially purchased and the (put strike – put premium). For those investors looking to generate monthly cash flow while at the same time positioning to buy that same stock “at a discount” and doubling our position size, the covered strangle may be an appropriate strategy to initiate. Premium and video members: Just added to your member sites is Ask Alan 146: The Cost of Rolling Out and Up. Only premiums have access to the entire library of (now 146) Ask Alan videos as well as our Blue Hour webinar series. BCI: Selling an equal number of in-the-money and out-of-the-money for new positions. The VIX has settled into a bullish range. The 6-month charts point to a slightly bullish tone. In the past six months, the S&P 500 was up 5% while the VIX (12.65) moved up by 10%. The volatility trend as well as economic news and corporate earnings bode well for profit opportunities. Previous articleDo You Recognize These 4 Early Warning Signs Of A Non-Diversified Options Portfolio? 50K A Week Scam Review – RELIABLE AND HONEST?!?! ?